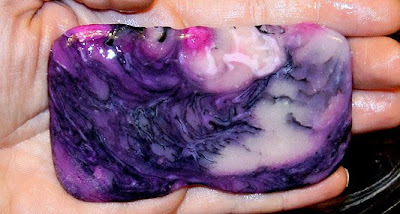 Some bars of soap become even better after they are wet. You start seeing all the fine swirl lines and combos of colors within the bar. 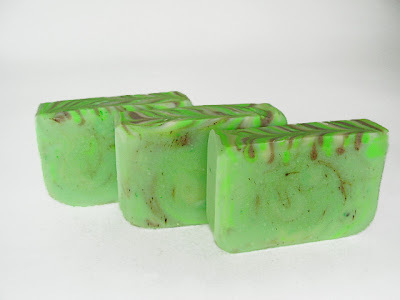 The batch of Enchanted Apple soap(see pic) is one of those that transforms to another level when you get it wet. 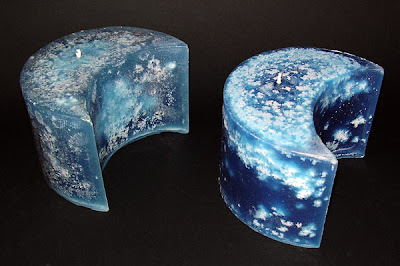 Poured some Blueberry Cobbler soy container candles last night, almost ready to list them. I still need to figure up shipping costs on them, darn glass is so much heavier then my normal pillar candles. Also still working on 3 star candles in basil sage mint, after one girl smelled the soap she wanted candles in the same color and scent for her room. Basil Sage Mint is starting to really grow on me, such a fresh scent. Other then that I took it easy this weekend for once. 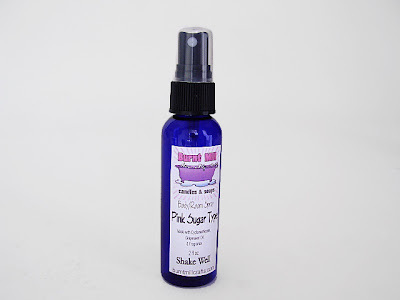 I was so addicted to the Pink Sugar scent I made body spray for myself. I decided I would start carrying body spray about 1+ years ago but in truth that was just a cover so I could make it for me, lol. So finally after all that time I am ready to actually start making body sprays for other people. This was yet another thing on my never ending project list to work on and I finally got done making a label and taking pictures of it. Made a fresh batch of this one this weekend. Been awhile since I carried this one, but as spring is here and summer is around the corner it seemed it was time again. Next up I think is going to be more Love Spell soap, getting low on that one. Tonight I also took pictures of my soap sampler pack. Well earlier this week I made Warm Vanilla Sugar type soap. I would post a picture but due to the vanilla in it I need to wait for it to turn brown first. Strawberry Cheesecake with rainbow red mica and white mica. Finally a strawberry scent that rocks! Next up is Warm Vanilla Sugar type I am thinking, just trying to decide what colors to make it. Finally got my supplies today so I am back in business. 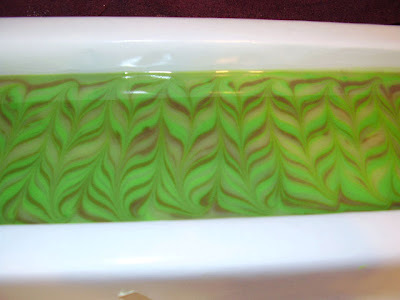 Just in time as I ran out of Summer Medley soap, so that is the first batch I made. Sad this is the last of this scent the supplier isn't going to carry it anymore and I was able to get the last they had of it. 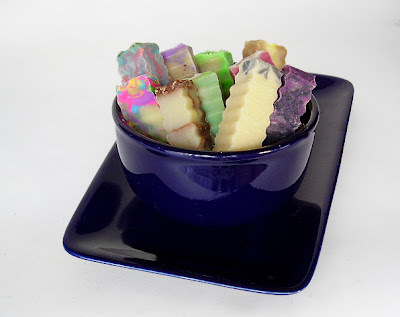 Going to have to look for a replacement scent for my 6 color swirl soap. Summer Medley is a perfect blend of fruits that screams summer. Sweet oranges, ripe strawberries, sliced lemons, lime juice, grapefruits and red raspberries. A wonderfully unique, strong scent. 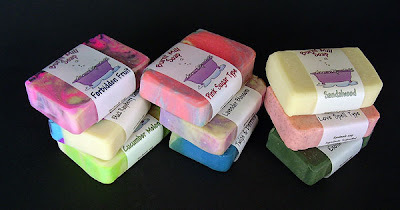 Don't forget to sign up for the soap give away! I thought about going all nuts and posting everywhere I am doing a give away but I decided I would rather have those that really read and follow my blog to have better odds of winning. The time has come for my soap give away. 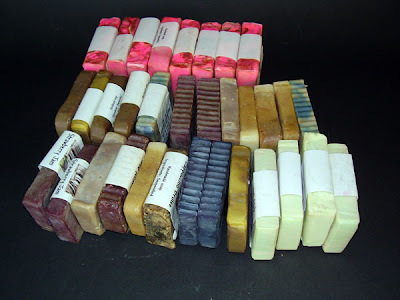 I need more room for curing soaps so it is time to clear out my old scents, smaller bars from my old mold, scents that didn't work as good as I would have liked. These are still good soaps just not great ones. 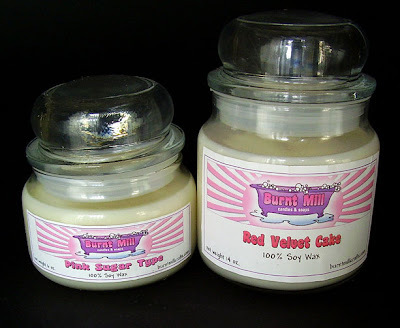 They will range from pumpin pie, strawberry jam, cotton candy, cupid, lemon bundt cake, green apple and other random ones. 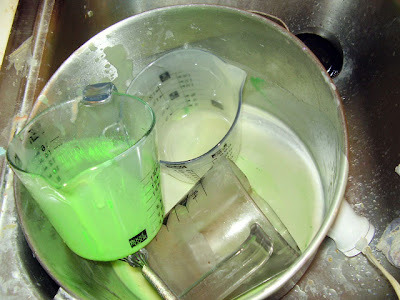 Great to use or for those of you who like to rebatch. I will pick a winner out of the comments(1 comment per person) on March 15. I will use http://www.random.org/ to help pick the winner. 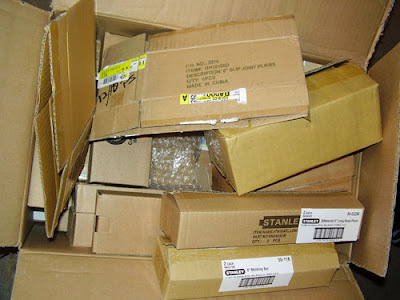 Did get my big box full of little boxes for shipping small orders of soap. I had ran out and had to get my mom to hook me up again, she picks them up at work and manages to find me a good range of sizes for all orders. Just got a big order of 12 bars of sandalwood soap, I can't seem to keep that one in stock. So instead of making new batch Oatmeal, Milk & Honey I will now be making some more Sandalwood tonight. I also took a bunch of product photos this weekend(see pics) and should be getting my website updated soon now that I finished working on taxes. 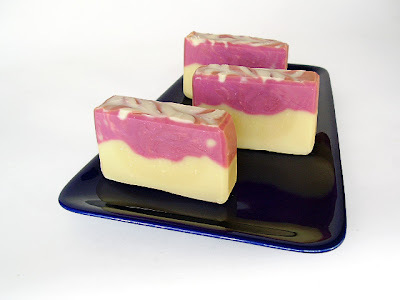 Ordered more supplies I will soon be making Warm Vanilla Sugar type, Strawberry Cheesecake and basil sage mint cp soaps!